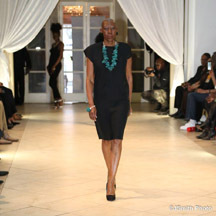 Carolyn Phillps heats up the runway again during the 4th annual fashion event. Fashion @ The Mansion IV takes off Sunday, March 31 at 5:00pm at Newton White Mansion, Mitchellville, MD. “We started the event to promote up and coming designers and other talents,” said co-founder and designer Ola Raphael. The fashion event will feature several designers including Ola Raphael Designs by Raphael and Flowerbaum by Donna Henderson, d'Kultered Kunsepts by Carissa Bernard, Xavier Furs by Xavier Shariff, SinJin by John Tillery, Creations by Bouvier by Aristotle Bouvier, Caribbean H2O dud Island Rhythms by Henry Marsham, and High Society by Michael Carter. Actor/Comedian Frank James will host the show. James is most famous as Robert Dillianin the 2019 short drama, “Broken Exchange Uncoded .” Tyrone Spencer, DJ Suspence, will serve as DJ. A Meet and Greet with models, designers, photographers, and production staff takes place after the fashion show. General Admission is $35.